​Community. It's why we formed this little non-profit organization 6 years ago. ​The type of community that rallies behind a vision, embraces it, and aids not only in its growth, but forces us to ask what more we as an organization can do to impact the people around us. The people who pick up and put down their feet during our little race (in record numbers) when the weather is not cooperating continue to amaze and humble us. We are grateful that you and your families feel strongly enough about this mission that you would give up a part of your Holiday to spend it working together in order to aid small, but not insignificant, efforts like ours. We’re not perfect. We have run out of water. We have missed an occasional T-Shirt. But 99.8% of the time, we believe we get it right. Whether we share a wave or a beer afterward, we can look each other in the eyes and know that our time together has resulted in the betterment and benefit of others. That’s why this was started, and we believe it is why our race continues to grow. 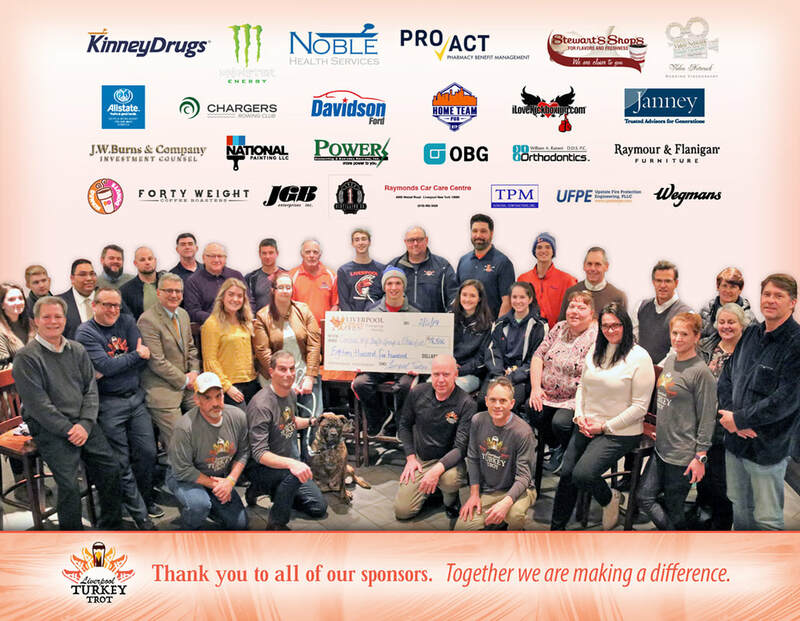 From our largest sponsors to our youngest racers, and the volunteers who selflessly donate their time, we say thank you for a successful 2019 Turkey Trot. The Liverpool Turkey Trot is now a 501(c)(3) status and is a premier run with a festive atmosphere and an awesome park setting to start your Thanksgiving day! Since its humble beginnings 6 years ago, when 124 runners entered, the LTT has grown into one of the largest and festive turkey trots in Central New York with 1000 strong and growing! 5K & 5 mile run, bag pipes, music, games, great supply of morning food and beverages, and an LTT registration bag!